The scarce water that hits Shimla has caused that the people who reside in that district of the Asian country blame to the agrimulturists and the tourism industry of the liquid exhaustion. In this region the water supply depends on people called "key men" who open and close the valves in each neighborhood everyday. Problems with the supply began to worsen on last May, when several households ran out of water for more than 20 days. This situation provoked the wrath of the population towards those in charge of regulating the water network. It was souch a problem, that a court granted them police protection to carry out their work. Some of them received threats, offenses and even harassment while leaving their homes. Shimla is a mountainous area of India that every year becomes the summer resort for thousands of people who tend to visit fleeing the overwhelming heat of New Delhi. That is why, during the summer season, the population doubles. However, last month's drought was so extreme that many residents asked tourists on social networks not to visit the city so they could have some water. It was recently announced that India is facing the worst water crisis in its history, a situation that threatens the lives of millions of people. On top of that, the city's old pipe system, built more than 70 years ago, has recorded leaks of approximately 5 million liters of water every day. 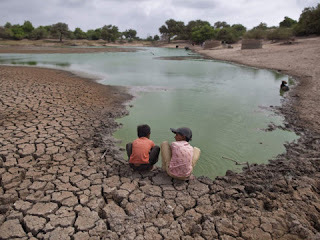 I is worth saying that the figures are alarming, around 600 million Indians, approximately half of the population, face high and extreme water shortage conditions, and about 200,000 die every year due to inadequate access to water. It is expected that the modernization of the system, with a high cost of 105 million dollars, will be completed in 2023. On the other hand, a factor that contributes to worsen the situation is that in India, in addition to many of the cities have outdated water distribution systems, there are few conservation measures such as capture of rainwater and melted snow. In Shimla, the water crisis has eased a little since last month, thanks to the authorities dividing the city into three zones, to rotate the distribution of water between them, so that no one runs out of water for more than two days.